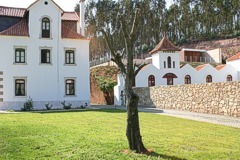 Accommodation at Quinta da Vila Francelina. Quinta da Vila Francelina is in the natural reserve of Frossos which is in the Beiras region of Portugal. The house is 9 kilometres from Aveiro, known as Portugal’s Venice, and 18 kms from the beach. Aveiro is an unusual town being criss-crossed by canals lined by brightly painted art nouveau houses and spanned by hump-backed bridges. Seaweed is gathered in the vast saltwater lagoon by colourful “moliceiro” boats. The “Quinta” is in a pleasant position with easy access to the main roads in the area. The main house at Quinta da Vila Francelina was originally built in the last quarter of the 19th century with many traces of "Art Noveau". It is surrounded by an exceptionally interesting landscape. One of the house’s main features is the beautiful frescos in some of the bedrooms and other rooms and with some ceilings are decorated with paintings. The main house as three storey having three bedrooms, a library, a living room, dining room, six bathrooms and a kitchen. All bedrooms have an en-suite bathroom, central heating, television, telephone and Internet access. There are two more modern wings with another six bedrooms, one suite with an independent entrance and a kitchen with an old fireplace. All these bedrooms also have an en-suite bathroom, central heating, television, telephone and Internet connection. The property has gardens and a significant woodland area where guests may take pleasant walks. Facilities in the property include a swimming pool, tennis court and there are bicycles for hire. 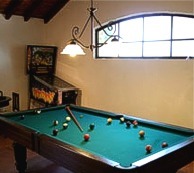 There is also a games room with snooker table and table tennis table. Available soon will be mini golf and a jogging track. A few kilometres to the south-east of Aveiro is the lively university city of Coimbra which is a mixture of ancient and modern architecture. Its streets are filled with the chatter of black-caped students and the soulful tones of fado. The university library, one of the best in Europe, is a Baroque fantasy where the rooms each lead into the next creating a telescope-like effect. The old cathedral is one of the most important examples of Romanesque architecture in Portugal. The coastal area stretching from Aveiro to Figueira da Foz and to Peniche is very beautiful with some of the best beaches in the country. Horse riding is available approximately 5 kilometres from the property.